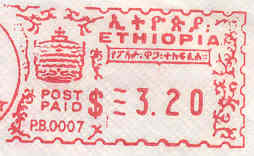 Symbols of Empire: This meter mark was used by the Bank of Ethiopia from 1933 to the beginning of WWII. It was produced by a Roneo-Neopost mechanical single rate meter - the first ever postage meter in Ethiopia. 1954 Small Proofs: These proofs were prepared for possibly a business or the post office in Asmara, Ethiopia. These were produced on a Simplex mechanical omni denominational postage meter machine but were never postally used. It was denominated in Ethiopian Dollars. 1954 Large Proofs: These proofs are tall and wider than the 1954 small proofs. Other than that, they are identical. These were also produced on a Simplex mechanical omni denominational postage meter machine but were never postally used. The proposed small and large meter proofs represent the first post WWII meter marks. Crown Logo: This meter mark was produced on a Pitney Bowes mechanical onmi denominational postage meter machine. They bear an Ethiopian Crown symbol in the upper left hand corner and a floral design along the right hand side of the mark. This mark was probably used from the early 1960s. Most likely its used ceased with the killing of Emperor Hailé Selassié in 1974. It was denominated in Ethiopian Dollars. Provisional Socialist Logo: The socialist plow share logo meter mark was also produced on a Pitney Bowes mechanical omni denominational postage meter machine. This was used from sometime in the late 1970s to sometime in the early 1990s. It was denominated in Ethiopian Birr. No Logo, Birr Denominated: In 1988, the Provisional Military Government of Socialist Ethiopia became the People's Democratic Republic of Ethiopia. Sometime after this transition, a new meter mark surfaced. This was produced on a Pitney Bowes omni denominational postage meter machine. People's Democratic Logo - Small: Sometime around 2000, a new Neopost meter mark came into use bearing the People's Democratic logo, a five pointed star. People's Democratic Logo - Large: Sometime around mid to late 2000s, another People's Democratic Logo meter mark came into use. This time produced by a Pitney Bowes machine. This particular meter - 00205, is installed at the NIB International Bank in Addis Ababa.